In a game changer that could bring down a university president, the Missouri football players are showing just how powerful their labor is. EDITOR’S NOTE: UPDATE, 11/9: University of Missouri President Tim Wolfe resigned Monday morning at a board of curators meeting in the wake of campus protests calling for him to step down. On Saturday night, the black players on the University of Missouri’s football team—a team in the national-title hunt just two years ago—went on strike against racism. The strike has the potential to cost the Southeastern Conference football program millions of dollars, because the conditions for black students on campus have become simply unendurable. The power of this action cannot be overstated. These football players have forced people to educate themselves about a campus environment that has been on fire for months, if not years. (Here is a timeline.) This year activists on campus have protested over the rights of adjunct professors, the cutting of healthcare benefits, the rolling back reproductive rights for women, and a hostile climate for students of color. And a recent series of ugly racist incidents led the football players to take collective action. For a team that two years ago stood in solidarity with teammate Michael Sam when he told the world he was gay, they again made the lionhearted decision to rise to the moment. But the strike does more than raise the visibility of the struggle. It has the very real potential of actually forcing the removal of Tim Wolfe from his position and getting someone in the seat of authority capable of addressing this poisonous campus climate. 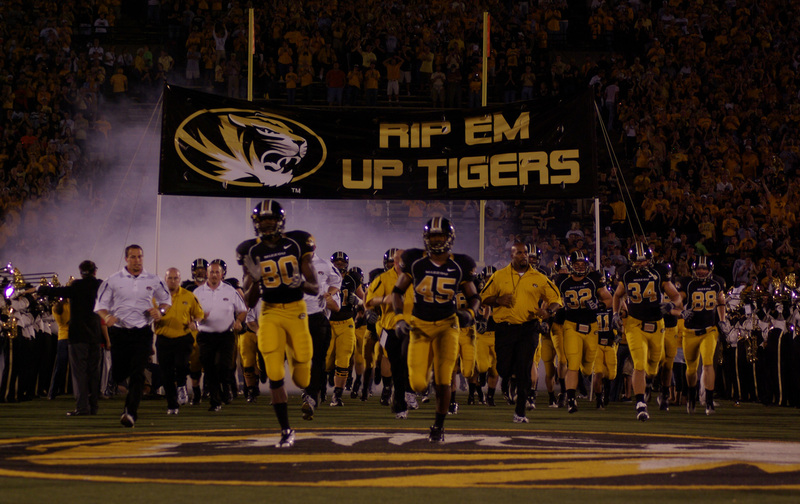 That’s because the Missouri football players—like all big-time college football players—hold a deep social power. The student body is just 7 percent black, yet 58 of the school’s 84 scholarship football players are African-American. There is no football team without black labor. That means there aren’t million-dollar coaching salaries without black labor. There isn’t a nucleus of campus social life without black labor. There isn’t the weekly economic boon to Columbia, Missouri, bringing in millions in revenue to hotels, restaurants, and other assorted businesses without black labor. The power brokers of Columbia need these games to be played. Yet if the young black men and those willing to stand with them—and there are white teammates publicly standing with them—aren’t happy with the grind of unpaid labor on a campus openly hostile to black students, they can take it it all down, just by putting down their helmets, hanging up their spikes, and folding their arms. If Wolfe goes, it will show how university power really works in a country where football coaches are often the most highly paid people on campus and universities are like a company town whose primary business is football. The actions of these players is best understood as a rumble of the sleeping giant. We have felt similar stirrings in recent years when Northwestern football players pushed for union recognition and the players at Grambling struck against their unsafe working conditions. When players take these kinds of direct actions, they show what they really are: a labor force. And like all labor forces they are concerned with issues like union rights, safe working conditions, and some form of redress if they are in a hostile work environment. Based upon what’s been happening at MU, it is certainly that. Tim Wolfe is on the clock and it is difficult to imagine him surviving this. It recalls the comments of former Ohio State President Gordon Gee, who said when asked whether he would fire head football coach Jim Tressel, “I just hope he doesn’t fire me.” But make no mistake, if “Pinkel fires Wolfe,” so to speak, it will be because his players made their coach choose a side—risking their scholarships and security to do so.